I read quite a few finance and economics blogs, many more than the list on the right would have you believe, and while they are really good for the most part, sometimes people make mistakes. Today I call out two people on their mistakes: Barry Ritholtz of the excellent The Big Picture and Jake of EconomPic Data, who makes some of the better eye candy in the economics blogosphere. This morning, Barry called the economists at the Federal Reserve innumerate. As someone who has a decent grasp on numbers and studied economics, I resent that. Listen here, Ritholtz, the .com bubble was a no-brainer in 1999 and late 1998 and the housing bubble was obvious in 2005/2006 when even the Gawkerites had that long running joke about never being able to afford a brownstone in Brooklyn and "Flip This House" was a hit TV show. That all was straight out of "Extraordinary Popular Delusions and the Madness of Crowds " but calling a nascent bubble in 2003/2004 wasn't so simple. I like to rag on timmay, benny, hankay and the maestro as much as anyone--although never Volcker, he's my boy--but they are not stupid, much less innumerate. Their version of Do The Right Thing might differ from yours and mine, but we are just going to have to accept that since we can't vote for Fed chairmen ourselves. 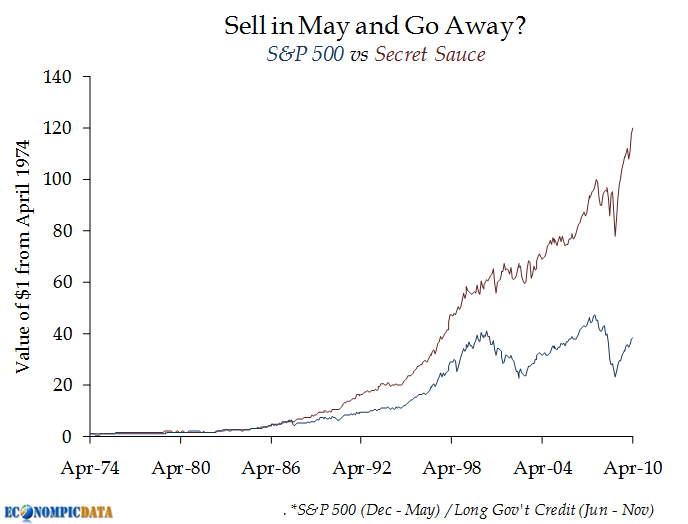 Sell in May and go buy secret-sauce bonds? Today, Jake posted a graph of what would have happened if you invested in this instead of that. I hate those graphs, they are remarkably useless 99.9% of the time and are just screaming DATA MINING. As a fellow economist, I expected more from you Jake. Seriously guy. 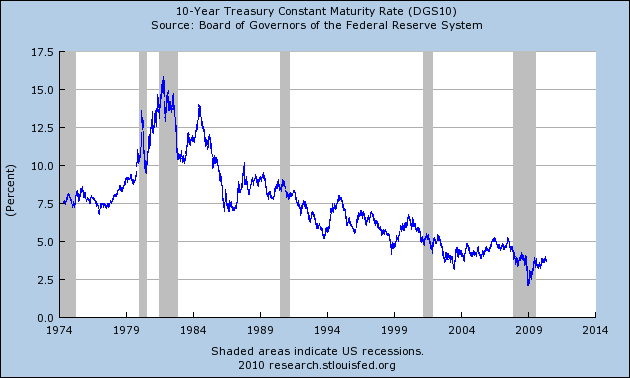 Look at how that interest-rate graph behaved and look at how the secret-sauce portfolio started outperforming in the mid 80s when interest rates were coming down from all-time highs. Of course holding on to fixed income instruments at a time of dropping rates is going to result in gains, duh! Try the experiment again with floaters, callables or anything with negative convexity and see what happens. My guess is it won't be quite as spectacular. 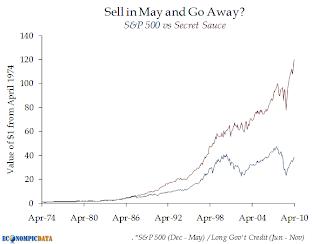 Try it with full-year "secret sauce", or zero-coupons for the Summer and watch your fake portfolio make. it. rain.